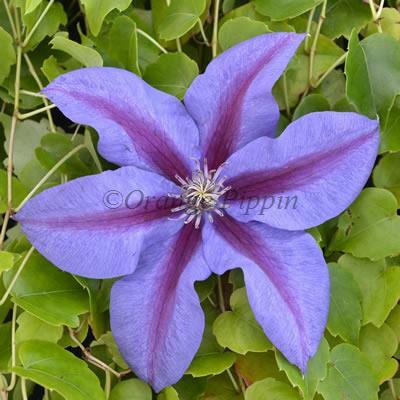 Clematis 'Mrs N. Thompson' is a most imposing variety having a rich crimson stripe on each of the purple petals, a real show stopper in any garden during June and then again in September. This non-evergreen climber tends to flower at the expense of making growth, so is highly suitable for planting in a container, trained up bamboo canes or an obelisk on the patio or for the smaller garden. Clematis 'Mrs. N. Thompson' was raised by Walter Pennell of Pennell and Sons nursery from a seed sown around 1954 and named after the wife of the nursery office manager in 1961.